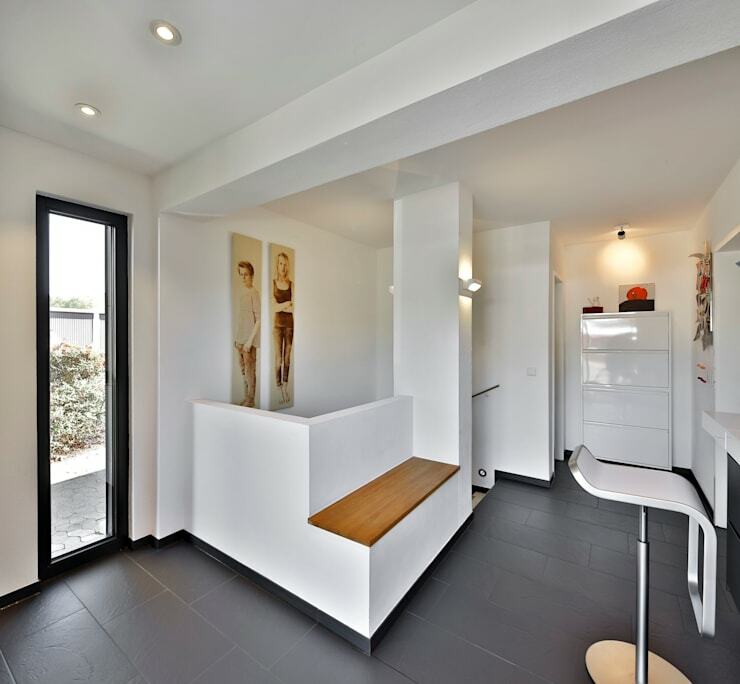 This bungalow in Ulm, Germany, was built in the 1960s and was dying for a modern and stylish makeover. So the owners approached the interior architects at 4PLUS5 to redesign the entrance area as well as the hallways, kitchen and bathrooms. And as you will soon find out, the final outcome looks marvellous. Elegant colours, chic doors and windows, and bright interiors will leave you impressed. The entryway is now a very functional and welcoming space, while the kitchen and bathroom look smart and cozy. 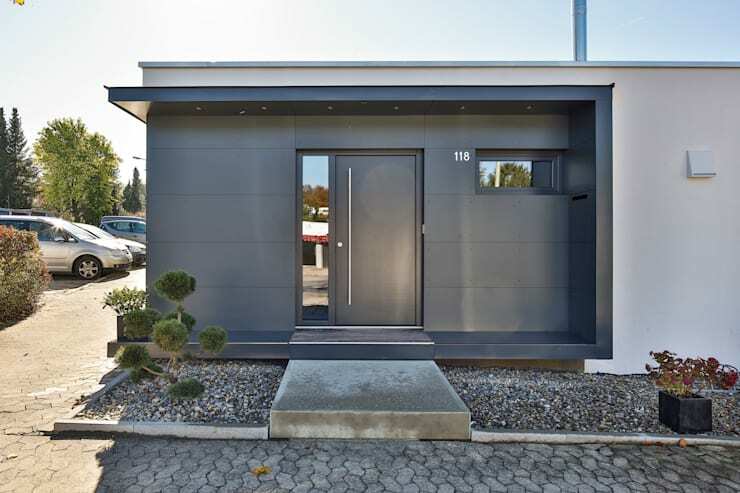 The stylish glass and wooden entrance door has been painted in grey to complement and blend in with the rest of the bungalow. 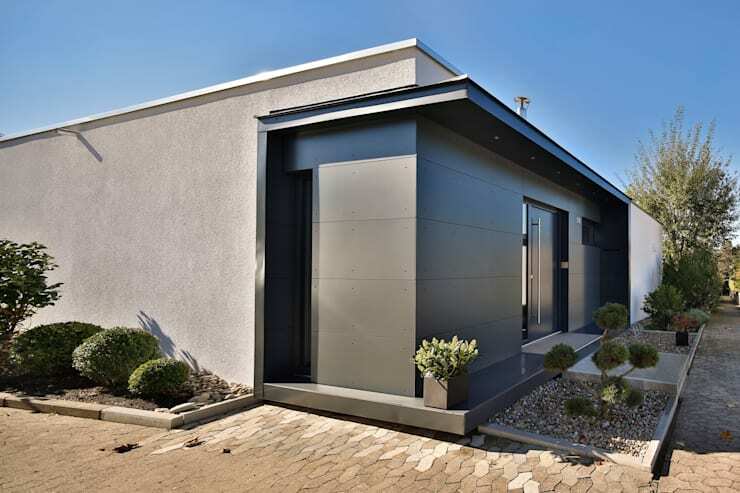 A sleek long handle adds shine to the facade, while a neat concrete slab leads to the porch. Rendered in dark grey, the exterior of the house looks bold, unique and very trendy. Neat and simple detailing adds personality to the structure, while trimmed bushes and pebbles make for beautiful edging. The smooth finish of the facade invites us to take a closer look. Spotless white pairs with cool shades of grey to make the entryway bright and welcoming. Large tiles on the floor look elegant under the glow of recessed lights. The floor to ceiling cupboard on the right and the shelves in the corner allow you to organise coats, shoes and umbrellas with ease. To the left is the kitchen with a wooden bar counter for a quick drink. A tall glass window set in black frame brings in tons of sunlight to keep the entryway warm and bright. The wooden seat is a godsend when you have to take off complicated shoes, while the retro style pictures add personality to the space. A tall chest of drawers at the far end blends well with the white wall and offer extra storage. 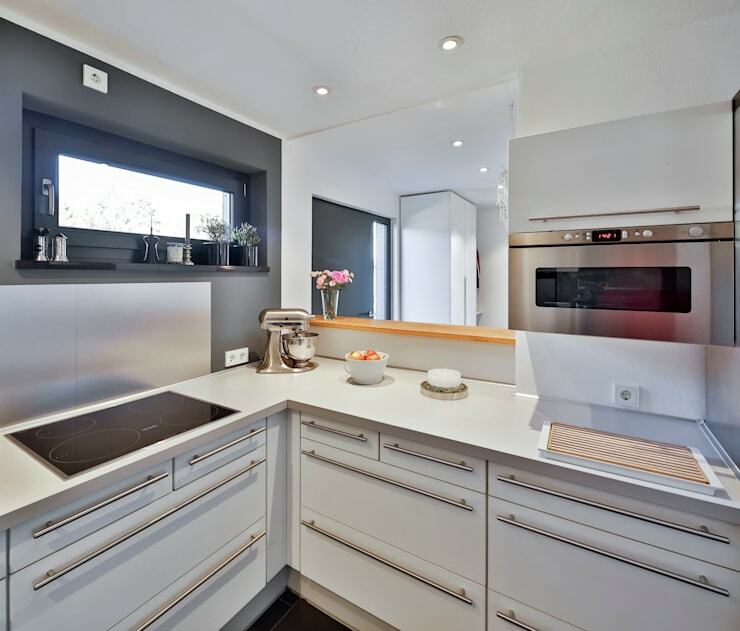 A neat layout lined with modern white drawers make the kitchen convenient as well as chic. The countertop has enough space for cooking, prepping and washing. And the oven has been wall-mounted to avoid cluttering the countertop. The slim window ledge comes in handy for organising spices and small potted greens. 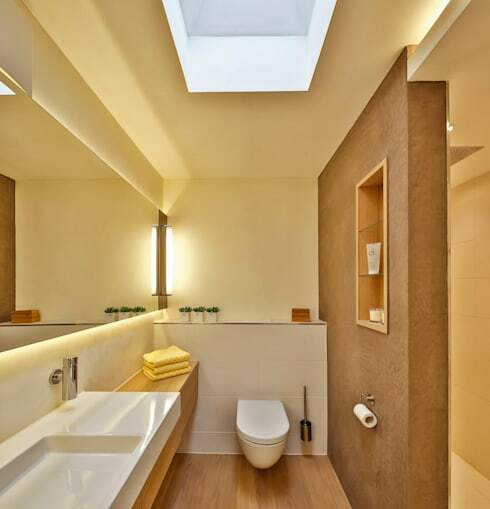 Golden glow from stylish lights bathes the bathroom in cosiness and serenity. 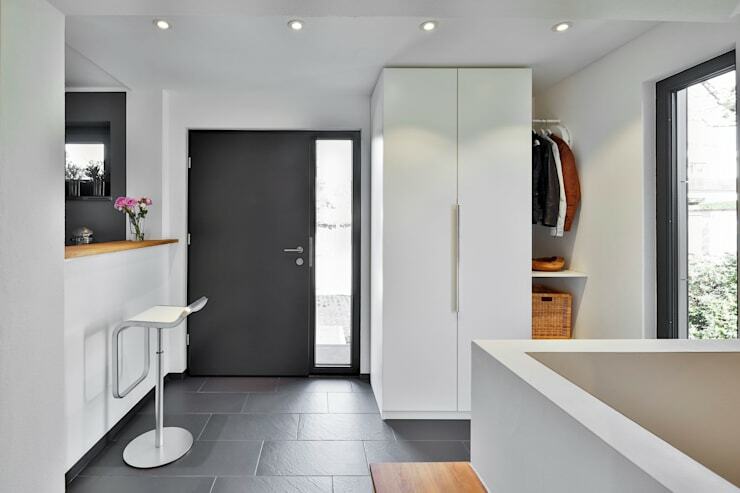 Sleek designs and niches make this a very functional space, while trendy sanitary wares make daily routine bliss. Wooden elements ensure warmth and the long mirror lends the illusion of spaciousness.